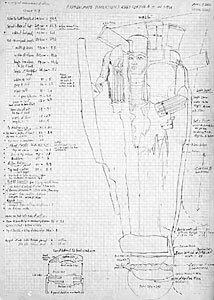 KV 63 is the first new tomb to be discovered in the Valley of the Kings since Tutankhamun’s in 1922. I worked there on site in 2006 and 2009, drawing the coffins. Under remains of workmen's huts, down a 20-foot shaft, in a rock cut chamber, six wooden coffins were found, along with two gilded coffinettes and 28 large sealed ceramic storage jars. 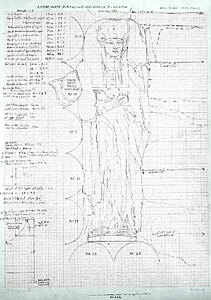 The objects were jumbled together, making things visible only from one or two angles. Extensive termite damage made the coffins extremely fragile. 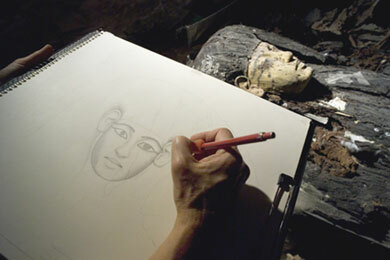 Drawing some of the coffins before excavation, some after, I used proportional tools, taking many measurements and photos. Although the exact date of KV 63 has yet to be determined, the style of the ancient artisans is a valuable resource, dating the finds to the late 18th Dynasty - roughly 3500 years ago. 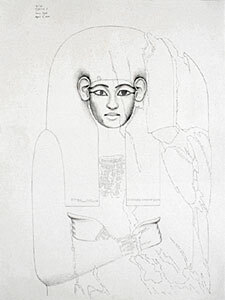 Seal impressions suggest that the tomb might even be contemporary with Tutankhamun's reign or shortly thereafter.